First, you have to get out of the box. What is the box? The box is conventional thinking. Shows like Law & Order, ER, and Hill Street Blues all exist within the context of reality. They are all great shows, but what happens when you leave that comfort zone? What happens when you think outside of the box? Below are five TV shows that think outside of the box. Some are currently airing while others have completed their run. The good news is, they are ALL available to watch on Hulu or Netflix. As mentioned above, one of the most common types of shows is the police procedural. Angie Tribeca was created by comedic genius Steve Carrell and his wife Nancy. Their show takes the classic police procedural and turns it on its head. This comedy is reminiscent of the humor found in movies like The Naked Gun and Airplane! By going the absurd route, we get the same classic tropes with hilarious results. The success of the Rashida Jones-led comedy proves that when you add comedy to a classic trope, the laughs will come. By thinking outside of the box, the creators of Angie Tribeca have given us a new twist on a classic procedural. Other terrific examples of extreme comedy procedurals are Scrubs (medical) and The Grinder (legal). 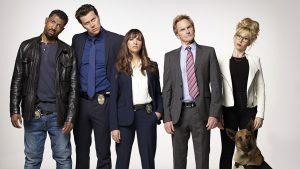 Angie Tribeca is about to enter its 4th season. Everyone can relate to what it is like to go to school. But surprisingly, not everyone knows what it is like to go to school with a diverse group of ages, religions and ethnicities. Thanks to Community, now you can. Diversity is more important than ever these days. We get Pakistani Muslim Abed, African American Christian Shirley and Jehovah’s Witness Troy, Caucasian Athiest Britta, Agnostic Jeff and Jewish Annie. Pierce Hawthorne is in a cult, and Asian Chang is the devil incarnate. What is great about television is that you can have a writers room, comprised of many different backgrounds. Developed by Dan Harmon and the Russo Brothers, Community takes people from all walks of life and sticks them together in a meta-filled study room. And what we learn is that despite our religious backgrounds, the more time we spend together, the more we learn how alike we all are. Community ran for 6 seasons (and maybe a movie?). Speaking of religion, that leads us to the next big question. What happens after you die? Unless you’re a vampire or a Sith Lord, you’re not going to live forever. Plot twist, that’s all of us. The afterlife has been explored on many shows, from Highway to Heaven and Touched by an Angel to Lost and Six Feet Under. Without proof of what happens after you die, the subject is a blank canvas. Regardless of your religious beliefs, there are so many philosophical ideas to explore. Currently, no show does it better than The Good Place. Like Community, this afterlife is filled with diversity. If you have an idea about what could happen after you die, television is a terrific place to explore new ideas. The Good Place is currently airing its 2nd Season on NBC. The Last Man on Earth which takes the Gilligan’s Island premise and makes Earth the Island. It’s a Zombie Apocalypse show without the zombies. While The Good Place asks what happens to you when you die, The Last Man on Earth asks what happens when everyone else dies and you live? It’s a trapped in an elevator show with five strangers, but Earth is the elevator. This show teaches you how you can sometimes be forced to deal with personalities that don’t immediately gel with your own. Created by Phil Lord and Chris Miller, the hilarious comedy duo behind The Lego Movie and 21 Jump Street movies, this Will Forte-led ensemble takes a deadly serious subject and teaches us that no matter what tragedies befall you in life, the most important thing you can do is to just keep living. When a tough situation rears its ugly head, we have to set our differences aside and work together as a team. The Last Man on Earth is currently airing its 4th season on Fox. As a kid, I loved the movie Who Framed Roger Rabbit. Seeing animation and live action meshed together can be a real kick. Jason Sudekis brings his unique comedy stylings to the hilarious Lord & Miller sitcom Son of Zorn. Sudekis, who voices the cartoon Zorn, returns to California to have a relationship with his son, Alan (Johnny Pemberton). He also has to deal with his ex-wife Edie (Cheryl Hines) and her new husband (Tim Meadows). However, while Alan looks like a regular Caucasian teenaged boy, not all is as it seems. This show teaches us what it is like to be from another culture, in Zorn’s case, Zephyria, and how it can sometimes be hard to fit in. As an immigration parable, told through an animated lens, we get to understand what it is like to be in a country where people look and act differently from you. It is a show of assimilation and acceptance. Unfortunately, Son of Zorn was cancelled after one season, but as Freaks and Geeks taught us, that has nothing to do with its quality. It just never found an audience. Until now. Go watch it! As our world continues to melt inside the pot, let’s all be on the right side of history, and create shows that help us relate and accept new cultures as we all build a better world. Writers have a unique opportunity. We get to share our voice and ideas with the world and erode discrimination and prejudices. We get to be a part of the solution. Make it your new year’s resolution to check out some of these shows, and then go out there and think outside of the box with your own writing. In the comments below, tell me your favorite show that thinks outside of the box. 20 Replies to "5 TV Shows That Think Outside Of The Box"
These are all great shows, but they are shows that have been created by people who already have plenty of pull in the industry. I’d like to see a list of shows from more recent inductees into the halls of TVdom. I think it is important to remember that all of the people who created these shows were once just like you and me. The way they were able to create these shows was because they were studying what was currently on television and then figuring out ways to improve it. That’s my main point regarding why I think these five shows are interesting to watch. What is working right now on Networks? When you understand that, you can create great work. Maybe I recommend picking one or two of the people who created these shows and reverse engineer their career. See if you can find out how they got started. A lot of times it is at a place like Second City, Groundlings or Upright Citizens Brigade. Have you seen the movie Don’t Think Twice? That’s a great window into the world of what it is to perform comedy. I hope some of this helps! Thank you for your response. No women who are not “young”? Great little piece. Gave me some inspiration. thank you! Sledge Hammer (David Rasche in the title role) did the “Airplane-type” comedy thing years ago but it only lasted two seasons and 41 episodes. It was a “Dirty Harry” parody that sometimes worked well and other times fell incredibly flat. Oh wow, I totally remember that show! What about “Crazy Ex-Girlfriend?” I think this show has done some wonderful stuff! Musical numbers, both breaking and poking fun at ethnic stereotypes… definitely out of the box! Great suggestion! I’ll put that one on my list to watch. So many great shows! And the more outside of the box, the better! Just to clarify things, before there was “Sledge Hammer” there was the equally absurd “Police Squad (In Color)” followed by the film “The Naked Gun: From the Files of Police Squad”. “Airplane”, “Police Squad” and the “Naked Gun” spin off were all from the fertile minds of the producing, directing, and writing team of David Zucker, Jim Abrahams, and Jerry Zucker. Of course before that the Police genre was treated comically in the great “Barney Miller” and even before that in “Car 54 where are you”. So nothing is really new except the way you approach your idea. Also, some great material in the Old Testament for good drama parallels. All jokes aside, you bring up some great shows. I referenced the Zuckers and Abrahams for Angie Tribeca. You know, you could almost take Police Squad the TV Show and use it as the short film that got The Naked Gun made! That’s from my other article about turning your feature film into a short film and how it can help get your movie made. All of the above shows I referenced are most certainly derivative of shows that came before them. It really is an endless cycle. But I also think a lot of these shows were able to add to the previous incarnations. Sort of like a rubric’s cube… twist one side and you have a whole new pattern on every side! If that makes any kind of sense. Haha. Thanks for the comment! Forgot to mention “Brooklyn 911″and “Reno 411” for other examples of out of the box police dramas. 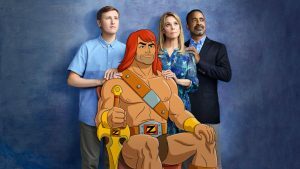 Son of Zorn seemed like a program for the Adult Swim/ Cartoon Network audience that failed in a mainstream network. Sometimes “out of the box” is a box of its own. I was a fan of “Community” until the “meta” approach became overbearing. There needs to be a balance between just enough wackiness and too much. Haven’t heard of “The Good Place” but will check it out. Another one season show was “Imaginary Mary”. Like “Son of Zorn” it probably was too weird for its network slot. I came very close to referencing Brooklyn 99 (is that what you meant?) but figured I’d leave it to one cop show for this post. Also, I wanted to talk about that kind of Airplane humor. Brooklyn 99 is more like Parks and Recreation in a police station. Which makes sense since they are the same producer (who also does The Good Place – definitely check it out). Regarding Zorn, I have to imagine that production cost is high with the animation. I’ll always cherish Season 1 though, just like Freaks and Geeks. I still love Last Man on Earth – they’ve really done some terrific stuff – enough so that I don’t mind the novelty of the show’s title. Because all the people who have shown up are so great! 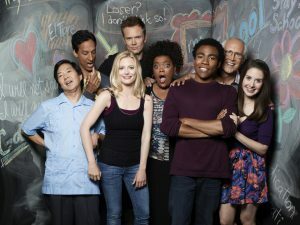 Community 1-3 is genius for me, also love Season 5. Seasons 4 & 6 stumbled but overall, I just loved these characters, even if they did each getting “kill off metaphorically speaking”!!! Sorry for the three posts. I just had another idea that a great place to look for OOTB shows is in the world of kids shows. What can be more OOTB than something like “SpongeBob” I mean he lives in a pineapple under the sea. Of course there was PeeWees Playhouse which is a great example of turning a genre upside down. Also an early nineties kids show called “Out of the Box” which had a truly diverse cast of kids and adults playing in an imaginary cardboard box playground. Lastly OOTB can usually mean short lived, as in the 80s sitcom “Herman’s Head’ whose fans remembered after the Pixar movie “Inside Out” came out with a very similar set up. Happy to read posts! Just glad you got something out of the article. Even if it is just a little light critical thinking! Last post for this thread. I think a good exercise for this idea would be to take a popular show and see where its Rubik’s cube sides can be turned, to use your metaphor. For example what could an out of the box Game of Thrones or Breaking Bad look like ? I am off to contemplate that right now ! Jason, thanks for the article! I’ve not watched Angie Tribeca. I’m gonna have to check that out. I caught a few episodes of Son of Zorn and also really dug it. The one show on your list I’m having a tough time getting into is The Good Place. I’ve watched quite a lot of it and I still can’t seem to fully invest. I’d love to get your take on it and see if it’s just something that hasn’t occurred to me yet. I have two (what I consider OOTB) shows I’ll throw in the ring as favorites. First, 30 Rock. One of my all time favorites. From a character standpoint I think they hit it out of the park. From Liz Lemon to Jack Donaghy to Kenneth Parcell and Tracy Jordan, that show had some memorable characters. I also think the structure of the show—the cutaways, shotgun dialogue, physical humor, etc.—was incredible. Loved it. The other, though not a comedy, is Firefly. It certainly wasn’t the show that introduced the concept of the space cowboy but it took a new route. I love the diversity of the cast, the Star Trek-like philosophy of grappling with “bigger than us” issues and the fusion of Asian and Wester cultures. Even the archetypal characters all had their own unique spin. Great show. I think some honorable mentions are Studio 60 on the Sunset Strip (what can I say, I’m a Sorkin-phile) and Dexter. “Sledge Hammer!” was a “Get Smart!” style approach to “Dirty Harry” and was more edgy and political than “Police Squad” and certainly the empty headed and too derivative “Angie Tribeca” that has been taken to task for joke theft. “Sledge Hammer!” satirized gun culture with more dimensional characters than most parody shows, explaining why it lasted longer than “Police Squad!” “Angie Tribeca” is guilty of identity theft. All of these shows were written and produced men, and have mostly male characters. How come no one notices that key piece of information? That’s a terrific observation. As I understood it, Rashida Jones developed Angie Tribeca and it is a show that features a strong female lead, which is why I liked it. The Good Place also features a strong female lead and I believe Kristen Bell developed this show with Michael Shur. I also love the strong female characters in Community and The Last Man on Earth, though you are right to point out, the lead characters are men suffering from toxic masculinity issues. For me, Son of Zorn is another show that sends up toxic masculinity. As a man who has been raised in a world that sexualizes women, I think it is important to take these characters and show us men how we can change. There’s no hiding it that I’m a boy, and probably, that’s why many of these shows appeal to me. I’m very excited to see more shows written and produced by women! What are some female-centric shows that think outside the box that you would recommend I watch? I’d really like to know. Thank you so much for you feedback. Let’s write a better future for everyone!